Why did my higher ed colleagues take this course? 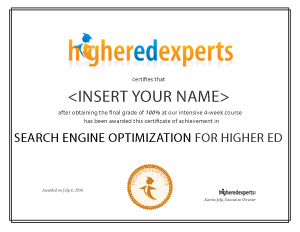 Many of your colleagues in higher education have designed their own Search Engine Optimization (SEO) strategy by taking this constantly updated professional certificate online course since July 2013. Can your target audiences find your website quickly when they search? Has your website traffic or search engine placement decreased lately? Do you need to increase your institution’s online visibilty and reach? What will I learn about SEO for Higher Ed? investing 10 hours per week of your time on your higher ed SEO training course materials, quizzes, discussions with your classmates and assignments. working on weekly search engine optimization and search engine marketing (SEM) hands-on assignments you can use the next day at work: memos, strategy plans, optimized pages, etc. Should I take this course on SEO for Higher Ed Course? The focus of this course is SEO/SEM for higher ed: everything will apply to your situation. Your classmates will all work at universities, colleges or schools: you’ll find out how other institutions tackle SEO/SEM challenges. Textbook (KINDLE version): The Art of SEO: Mastering Search Engine Optimization by Eric Enge, Stephan Spencer, Jessie Stricchiola. Recognized certificate of achievement in SEO for higher ed upon completion of the course with a final grade of 80% or more. Find out why Thomas Minnefor (@ThomasMinnefor), Web Manager at Rutgers University Biomedical Health Services took, liked and recommend this course in this 2-minute video recorded in September 2014 via Skype. Are there any prerequisites before taking this course? Im interested in this course and the analytics course and wonder if it makes more sense to take one before the other. Would I get more out of this if I understand google analytics better or visa versa? We have removed the formal prerequisite for this course at the request of professionals who already had a good foundation in Analytics and wanted to take the SEO course. However, if you plan to take both courses, it’s better to start with the Analytics course. Thanks for your interest in our SEO course, Karen! Students will need access to an AdWords account. However, they do not actually have to make any purchases. The assignments are based around what they would do if they were setting it up for CPC, not on actually launching the ads. They can simply create and use the free account and not launch the ads. This course was a fantastic introduction to SEO, but it also offers a lot of extra information for people who already know a bit about it. For anyone who writes for the web at the beginner or intermediate level, I would definitely recommend taking this course to bring your skills to the next level! With so many institutions looking to do more with less, having the knowledge behind SEO is extremely helpful. The discussion questions and assignments were key to helping me wrap my head around this new knowledge put it into practice immediately. I would definitely recommend this course for anyone in higher ed marketing or communications. Knowing the rationale for and strategies to maximize SEO are essential for building a larger online presence. Course content is well-presented, manageable and highly effective from a learning standpoint. I would recommend this course for anyone looking to solidify their SEO skills and to learn how to implement an effective Adwords strategy. The SEO course is very thorough and has moved me toward having a better understanding of this complicated, ever-changing topic. 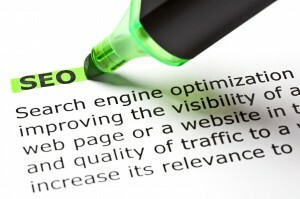 I feel confident enough to apply SEO principles to my site, that will make an impact on our success as an institution. Working full time in academia, you might think you don't have time for the course? No matter what your workload - I encourage you to make that time. This isn't just a class to teach you concepts - you'll learn techniques you can put to work for your college or university immediately, even while you're participating in class. And, the benefits don't just come from the materials and the instruction. The peer group you're involved with with bring their own unique perspectives, ideas that you may not have considered. Overall, I highly recommend the course - you'll be enriched and empowered to make an immediate difference. I would recommend this course to any of my colleagues looking to learn more about SEO. The course provided all the materials necessary to get started with, and expand upon, SEO strategies. Weekly class discussions were very productive, and helped provide different views on each topic as they related to my institution's website. I think this course provides valuable SEO knowledge, and am excited to share this knowledge with my team as we begin implementing new strategies. This course will provide concrete, actionable steps you can take to improve SEO on your site right away. The material covers the subject of SEO from strategy to implementation, and all of it is immediately useful. The interaction with classmates and the instructor adds so much value to the course! Another great course from Higher Ed Experts! Time well spent! The course exposes you to valuable concepts and very useful tools. The readings and resources are excellent. I am excited that I am able to put what I learned into use right away on my school's website. This was a great introduction to the principles and practices of SEO, through the lens of higher education. I came away with a strong foundation for how to evaluate and improve our website's SEO, and can now evaluate the SEO of our competitors through a variety of online tools. I'm also better prepared to optimize our cost-per-click advertising campaigns through A/B testing. I can't wait to talk to my supervisor and ad agency about what I've learned, and create a plan for implementation! If you are looking to learn more about SEO, CPC, and Conversion Rate Optimization, as well as how they can be maximized by higher education institutions, then this is the course for you. Our instructor was extremely knowledgeable about core principles as well as best practices. The tools and methods identified during the course are things that will benefit you instantly through real world application. I even find myself accessing materials well beyond completion of the course! One of the best things about learning these techniques over several weeks through HigherEd Experts is that you also benefit from having others in the course in similar situations confronted with similar issues at various institutions across the globe. Plus, the Ask a Professor feature will help you get connected right away to your instructor. The overall guidance and advice is most helpful and actually something you can use for your institution’s long term benefit. Within the first two weeks of this course, I was able to present our director of Transfer and Graduate Admissions and our dean of the School of Nursing with information showing how we could significantly increase the visibility of one of our online nursing programs by slightly tweaking how we referred to the program on our website. The information I was able to provide was so compelling that everyone involved agreed to officially CHANGE the name of the program to take advantage of the search engine optimization improvements I was suggesting. I would highly recommend this course. If you are interested in learning about SEO and CPC/PPC practices, but aren't sure where to begin, this course is an excellent primer for anyone looking to obtain a grasp on measuring online marketing efforts and develop the skills to improve your institution's online marketing strategies. The lessons and assignments are very focused and practical. Throughout the course I applied new tools and strategies to several real projects I'm already working on, and I shared my work with managers each week so that we can begin capitalizing on the coursework immediately. This is a great course for those who want to dive deeper into SEO, with specific strategies for the Higher Ed environment and great opportunities to learn from peers. Experimenting with SEO on your own can be costly. Do yourself a favor and invest in this SEO course. The course does more than just teach you about SEO. The course helps you develop a sound SEO strategy, before kicking off a paid campaign. I would definitely recommend this class for anyone who is interested in SEO or online advertising. I always thought these subjects were too advanced for me, but this class showed me that I really can do a lot of the work myself. The SEO class is the most practical and focused ones I've encountered. I am now totally prepared to take on an institution wide SEO strategy project. Thanks, Higher Ed Experts! I highly recommend this SEO course! It has provided me the expert knowledge required to effectively develop and maintain PPC/CPC campaigns -- incorporating SEO techniques, social media and analytics. Not only that, the timely real-world tips and insights provided by the reference material have opened my eyes on the impact search engine marketing plays on higher education. This course is worth it! This course has great discussions, an engaged professor and I learned a lot to help me develop SEO for my university's website.